Much of the organization and the direction of operation of the blockade were determined early in the war by the Blockade Strategy Board, an ad hoc committee including Captain Samuel F. Du Pont, chairman; Professor Alexander D. Bache, superintendent of the Coast Survey; Major John G. Barnard, of the Army Corps of Engineers; and Commander Charles H. Davis, recording secretary. The board (which had no formal name and was often referred to simply as "the Strategy Board,") first met on 27 June 1861, and filled many of the roles that would in later wars be filled by a Joint Staff. At the beginning of the blockade, it was correctly surmised that the character of the coast and the nature of the blockade would be different in different regions. So, the blockade was divided into the Atlantic Blockading Squadron, based at Hampton Roads, Virginia, and the Gulf Blockading Squadron, based at Key West, Florida. The dividing line between the two squadrons was roughly the southern tip of Florida. Upon the resignation of Flag Officer Silas Stringham, the commander of the Atlantic Blockading Squadron, the Atlantic Blockading Squadron was further divided into the North and South Atlantic Blockading Squadrons (NABS and SABS), with the new commanders appointed on 18 September 1861. The NABS' main base continued to be Hampton Roads, while the SABS' main base was situated at Port Royal, South Carolina, after its capture on 7 November 1861. The dividing line between the two was at the North Carolina-South Carolina border, and the SABS area of responsibility continued south to Cape Canaveral, Florida. 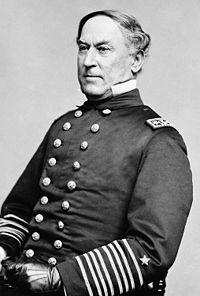 The Gulf Blockading Squadron was similarly subdivided, initially to provide a way to place David G. Farragut in charge of a fleet for the attack of New Orleans. The East Gulf Blockading Squadron (EGBS) continued to be based at Key West, and was responsible for the Florida coast from Cape Canaveral to Pensacola, Florida. The West Gulf Blockading Squadron (WGBS) was based at Pensacola and Ship Island, Mississippi, and was responsible for the remainder of the coast to the Rio Grande. Within each blockading squadron, the breakdown was again regional, with certain forces detailed to blockade each of the ports in the region. These forces generally reported to the most senior captain present at each location, who in turn reported to the flag officer (after 16 July 1862, admiral) commanding the entire blockading squadron. The squadron commanders reported directly to the Navy Department. Variations existed within every squadron. In the NABS, the Potomac River Flotilla, the James River Flotilla, and the vessels operating in the Carolina sounds usually operated semi-independently, though still nominally reporting to the squadron commander. In the SABS, the mostly ironclad force operating in the Charleston area from April 1863 till nearly the end of the war was under the direct supervision of the commanding flag officer/admiral. While the WGBS was under Farragut, he tended to remain with his striking force of heavy sloops (especially while on the lower Mississippi River in 1862 and 1863) and leave the administration of the blockade to subordinates.